Mined primarily in Burma, Sri Lanka, Tanzania, Thailand, and Kenya, the ruby is one of the most precious and rare of today’s naturally mined gemstones. Second only to diamonds in regard to hardness and quality, a fine ruby stone will endure beautifully for generations. Did You Know? 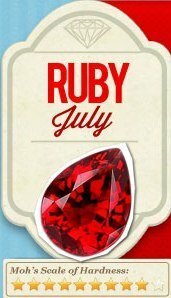 In ancient times, it was thought that the wearer of a ruby was blessed with health, wealth, wisdom and outstanding success in heart affairs. Furthermore, the wearer acquired the ability to live in peace with his enemies. In some places ruby was even thought to confer invulnerability.